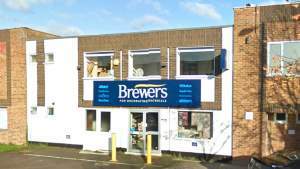 The Brewers Decorator Centre in Bicester is one of the town’s few places to source a good range of paints, wallpapers and decorating essentials and definitely one of the friendliest. It’s no wonder our name, before becoming part of Brewers, was Main Supplies. As well as the variety of products we keep in store, we have paint mixing facilities and customers can browse the full wallpaper and designer paint stock range using our internet terminal. Since we’re a trade specialist, tradespeople are welcome to book a site visit, so we can make product recommendations after seeing your decorating needs first-hand. Bicester Brewers has good disabled access, customer parking right outside, and is easily found. We’re on Telford Road, the first left off Launton Road after it leaves the A2241 roundabout or the next right after Lidl and Screwfix if you’re coming from the town centre end of the road.